Wireless projectors are perfect for on-the-go presenters. The ability to just set the projector down and wirelessly connect it to a computer or other device saves you a lot of time and frustration, especially when you are getting ready for a big, important presentation. However, wireless projectors can be kind of expensive and there isn’t always a need for one. That is when renting a wireless projector can come in real handy. A wireless projector allows you to wirelessly connect and display the computer video on a screen. It also allows you to connect multiple computers to one projector or many projectors to one computer, which can be very helpful in brainstorming meetings or collaborations. A wireless projector allows you to enjoy true freedom and also allows you to present from anywhere in the room without the hassle of tripping over cords or connecting, disconnecting and reconnecting multiple cords and wires. Hookup couldn’t be easier with One-Touch Auto-Everything Set-Up, like the one found on Panasonic’s wireless projectors. All you need is a wireless laptop or computer and a WiFi connection and you’re all set. In addition to being really easy to set up, wireless projectors make your presentation look neat and professional. A wireless projector gives you the flexibility of having the projector close to the screen with multiple users throughout the room. Presenters can be given permission to present as well, on one projector or on multiple projectors. 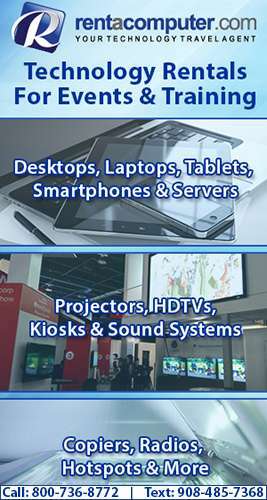 Rentourprojectors.com can set you up with any type of wireless projector rental you need whenever and wherever you need it. No matter what wireless projector you need or how many you need, Rentourprojectors.com will have them delivered directly to you by a professional technician who will set up and test all of your equipment to make sure it is working properly. So the next time you have a big presentation across the country and you want something to help make it look and feel more professional, consider renting a wireless projector from Rentourprojectors.com. Nationwide delivery and installation with a single point of contact ensures that you get the absolute best possible service.